NOW IN OUR fifth year of austerity budgets, government is today set to announce €2.25 billion worth of cuts and €1.25 billion of revenue raising measures in order to reach the magic adjustment number of €3.5 billion. But where is the axe going to fall and what are you most afraid of? Fenella Samways, 46, is a single mother who is living in Tipperary. She works part-time. Her main concerns are any cuts that will make it financially impractical for someone in her position to work. 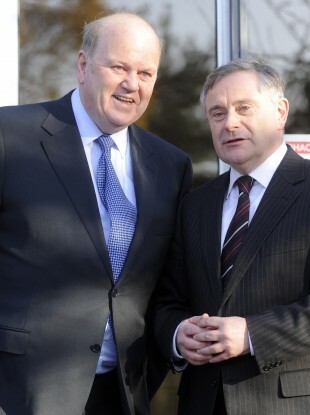 My partner and I returned to Ireland in 1998 from the UK where I had been working as an independent financial adviser. Unfortunately things did not go to plan and I have been raising my son alone since he was six and trying to build a home for us to live in at the same time. As there is no public transport where I live and no affordable childcare provision, I work part time during school hours as a company administrator for an SME. My child’s school is seven miles away and I therefore need a car not only to get him to school but to also get myself to work. I receive a reduced one-parent family payment (OFP) supplemented by a family income supplement as my earnings fall below the current ceiling of €506 per week for a family with one child. In budget 2012 all working lone parents earning above €130 per week received a cut in their OFP of €8.50 per week and it is already written in to reduce the income disregard to €60 per week over the next few years. This means a cut I am already going to have to re-budget for come January 2013. It also introduced a cut of €120 per annum to fuel benefit recipients and a reduction to the back to school allowance – both benefits that are paid to assist the most vulnerable in times of additional financial expense. This is on top of the household charge introduced last year that as a mortgage holder (just €2 per week, I heard Mr Kenny say, yet I can’t pay €2 per week) – despite being entitled to welfare – I am liable to pay. And like everyone else I have also seen a massive increase in ESB, gas and diesel prices over the past 12 months, as well as the knock-on effect of VAT rate increases in basic necessities such as food plus. On top of that, there are additional costs of water and waste charges. My fears for Budget 2013 are that lone parents and Ireland’s vulnerable will see a disproportionate cut in their income through either direct cuts or indirect taxes effecting what myself and everyone in this group of society spend every cent on. I would also fear a cut in the rate of one parent family benefit, along with an increase in the minimum number of hours required to qualify for the family income supplement. The working hours of lone parents are usually governed by school hours as the cost of childcare, if available at all, is too prohibitive and unaffordable. This is still a problem for the three months of the year when children are not in school. Any increase in the hours required will exclude many who are already working from being eligible and force them out of work and further into poverty. I’m also afraid that government’s promise of affordable and bankable childcare will not be met yet they will still continue with the reduction in the qualifying age for OFP recipients to seven. Any increase in the cost of diesel, petrol and car tax is a huge worry for rural dwellers such as myself. Many of us do not run a car by choice but by necessity. My car is 12 years old. I dread it breaking down as I could never fund to replace it. How would we then get to school and work? The household tax is also a real worry. I do not have any savings. I work, yet every week is a struggle to make ends meet. There is no spare money for a treat or youth club for my son. Birthday’s and Christmas fill me with dread. How I will be able to rejig my budget to make ends meet? What option do I have? My home is unfinished, it took me five years to save to afford heating in our home. There are no jobs and even if there were I could not afford the childcare costs? I cannot expect my child to walk seven miles to school every morning and the same home each evening? My son is a bright child, he deserves to have the same chances in life as every other child – and I worry constantly that I will not be able to fund his 3rd level education. It should be accessible to all yet I see cuts to grants for 3rd level increasingly making it “elitist”. I really hope that this government will realise the disproportionate effect the previous budget had on the vulnerable – and maybe take a much fairer approach? Would a one per cent hit to everyone not be a fairer option. We all realise cuts have to be made so surely we should all contribute according to ability. The one other change I would love to see in this budget that I feel would benefit all, is a change to the jobseekers’ benefit and jobseekers’ allowance that would pay a reduced rate based on a percentage of the 40 hour working week rather than on days. I see so many part time jobs advertised, yet no unemployed person can possibly afford to take up that work. This change would allow those wanting to work (of which there are many) to take up these part time jobs, would give them a financial incentive to do so, and would reduce the amount of jobseekers’ benefit or jobseekers’ allowance payable. Andrew O’Connell, 19, is a student and parent. He lives in Cork City. He is worried about an increase in student fees forcing him to drop out of college. I am studying Hospitality Management at CIT and am a young parent. Like the vast majority of people in college I have to struggle from week to week. I had my fee’s paid by my grant and I have my maintenance grant (which amounts to next to nothing). At the moment I have Christmas work which amounts to €50 or €60 a week. I have to pay money towards my son’s childcare, food, clothing and other expenses. The only expenses I have myself are the cost of traveling to college as I have to get four buses a day. After that I am only left with about a tenner for food for the week. Basically I can afford the very bare necessities. This budget is not looking good for anyone. My girlfriend and myself are already facing cuts to child benefit, cuts to the grants, rising utility bills etc and the means to pay them seem to be fading away. I took part in the UCC/CIT march against budget cuts in Cork City. We marched on Jerry Buttimer’s office and we more or less got told that “we live in hard times” and “everyone has to take cuts”. We were offended by his response and expressed that. What scares me so much about the upcoming budget is that the politicians who are deciding on our futures have actually lost touch with the public. How many of our “loyal” TDs have to worry about sending their kids to college? Will there be food in their fridge at the end of the week? Where are they going to get their next fiver from? The way things are looking in our lovely little country these days is that I will not be the only person forced to leave college next year. From what I have heard there are proposals to bring fees up to €2,500 this year and €3,000 by 2015. Maybe the grant will eventually be abolished and then everyone might as well say goodbye to further education in Ireland. All I want is to be able to get the skills necessary to be able to get a decent job so I can provide a living for my family and to pay my taxes. Is it really so much to ask for an opportunity to become a productive member of society? Elizabeth* lives in Dublin. She is on disability allowance and is waiting for an operation that should hopefully enable her to get back to work. Her biggest concern is for her adult son, who is also disabled, and who she believes is not getting the level of care he needs or deserves. Like so many others in Ireland this week, I am dreading the budget. I am already caught in the poverty trap and struggling to survive on disability allowance. With an adult disabled son and a 15-year-old daughter, the daily challenges we face just to survive are substantial. My life wasn’t always like this. I worked full-time almost my entire adult life and took pride in providing for my children. While we were never “well off”, I managed to provide a happy, if hectic, environment for my family. Yes, there were challenges and I had to budget and plan carefully but that’s just life! Then, three years ago I got sick and everything changed. I didn’t just lose my health – I lost my independence and my self respect too. I desperately want to get well again so I can go back to work and regain some of what I have lost. I need neurosurgery but as I don’t have private health insurance I am at the mercy of the overstretched, overburdened public health system that we enjoy in Ireland. If I had private insurance I would have had the operation 15 months ago and would be back in work by now! Instead, my condition continues to deteriorate while I wait for an operation date and the nightmare continues. I am very concerned that rent allowance will be cut again. Even though rents continue to rise (especially in Dublin) the government continue to cut back this essential support. I have been on the public housing list for over three years and there are still more than 1,500 people ahead of me. The stress of worrying if we have to move again is very real. Trying to find another house is daunting. Most real estate agents will not even show you houses when you tell them you are on rent allowance. It doesn’t matter what references you have – if you’re on rent allowance they don’t want to even speak to you. Having to move house earlier this year was distressing to say the least. It’s the first time I’ve experienced blatant discrimination and it was very unpleasant. I am also really worried that the housing benefit payment will be reduced again. Last year I lost six weeks of fuel allowance which has had a huge impact on heating costs. My 15-year-old is struggling getting up and going to bed in the cold but it’s especially hard on my son. He has sensory problems and the cold makes them a lot worse. He stays in bed most days until three or four pm as it’s the only place he feels warm. We can’t afford to have the heating on for more than an hour each morning and evening and it’s just not enough to heat the house. We’ve also had to cut our showers back to once every two days as our electricity bill is becoming unaffordable. The continued rise in petrol costs, insurance and motor tax is another cause for worry. I am lucky enough to drive a 14-year-old small car and even though I only drive locally, the costs associated with keeping the car on the road are challenging. I rely heavily on my car as my mobility is very restricted and I can’t carry things. But if there is a rise in these costs and/or my basic payment is cut again I will not be able to afford to keep it. There has been a lot of talk about the Children’s Allowance being cut. For me it’s a necessity – not a luxury. Like many other people this allowance helps pay the daily bills. I really wish I could use it to treat my daughter but it’s spent every month even before I receive it. There is also talk of them cutting back home help hours. I lost my 90 minutes of home help last year but at least I am able to get up, get dressed and feed myself. But if and when I finally have my surgery I will have at least twelve months of recovery. Who will look after my son? Who will help my daughter? Who will help me? I’m sure there will be no changes to the youth mental health spend. My son gets nothing and you can’t reduce nothing can you? He’s at home 24/7 and has no contact with the outside world. No one cares. No one will do anything. No one will help. There are absolutely NO services for him and I am worn out encountering brick walls in my attempts to get him some support. The longer he stays locked away from the world the harder it becomes for him to re-engage. I can only hope and pray that he gets the help he needs. And so I watch and wait to see how my life will change after 5 December. I can’t change the outcome – in fact I can’t do anything about it whatsoever. In the meantime I try to understand the mind boggling pensions that bankers and politicians enjoy while so many of us struggle to put food on the table and heat our homes. It is thanks to their mismanagement so many people are living in poverty. Why can’t there be legislation to change this? If I performed that badly in any of my jobs I would have been sacked! Why should they get anything? If the government can’t or won’t legislate to reduce the pensions and payouts why can’t they introduce a substantial tax and put this money into our health system? They can destroy my life and that of my family with the stroke of a pen so why is it so hard to go after the “fat cats”? Is it simply that they don’t want to? In this austerity driven country of ours every one of these TDs will be eligible for multiple pensions. It is immoral and wrong. I am sick. Yes, I am really, really sick of the whole lot of them. Don Donoghue, 29, is single. He is working in the private sector and living in Sligo. His main concerns are an increase in the tax rates and the long term effects of cuts in rural policing. Originally from a rural background, I am now living in Sligo Town. My view of my situation is that I am happy to be working and particularly in the Northwest of Ireland where it can be difficult to secure employment in my sector. I am paying taxes and receive no state assistance in terms of healthcare etc. I am happy to do so insofar far as people who genuinely need support receive the assistance they need and deserve. There are, however, a number of concerns for me ahead of Budget 2013. Primarily would be increases in tax rates or reductions in the tax band which would leave me with a reduction in take home pay. Also, as someone looking to purchase a house, the household charge/property tax is a major concern. It’s disappointing that after building/buying a house we are expected to pay what I believe is an unfair charge. As someone coming from a rural background, I see the cutbacks in rural policing as a particular concern. In the space of a few years my family home has gone from being an open house to a “fort Knox” of sorts, with my parents installing a monitored alarm system and no fewer than eight security cameras on our house due to the massive increase in burglaries. In the context of public sector cuts I really don’t want to see frontline services such as the Gardaí and nurses cut while high income earners remain more or less untouched in the public sector. It is sickening to think that (regardless of what the markets determine high paid public sector workers should be paid) frontline workers are quite literally putting their lives on the line due to a shocking lack of resources. That said, I believe that high paid private sector workers pay their dues and make a significant contribution to the exchequer. In the Sligo area the third level education cuts are of particular concern, with nearly 5,000 full-time students in the town. The difficulties with the student grant have seen a number of students drop out this year, and with fees on the rise and grants being cut, it is making third level education harder and harder to access. I also believe that this notion of assessing families for the grant on the basis of their assets could be disastrous for students from farming backgrounds and this will have to be considered before a final decision is made. If this was a wish list I would hope that my car tax (currently €678 for the year) would be reduced. I do feel a certain amount of injustice at the equality of the system but it’s hard to complain when other people are in a much worse off situation than myself. Patricia Donlon is a full-time carer to her two elderly parents. She lives in Tullamore, Co Offaly. For the last six years I’ve been looking after both my parents. My mother, who’s 87, always had bad eyesight. She also has arthritis of the spine and is asthmatic, so between that, her age, and her eyesight, there’s not much she can do. She used to be very outgoing, putting on plays in Tullamore with other elderly people where they’d be the actors and sing. Now she only gets to meet her friends once a week for coffee. Even taking her to mass on Sunday is a struggle. My dad is 84 and has dementia. It’s very hard dealing with the two things at once. Before I started looking after my parents full-time, I had worked in a small hotel. Between my mother’s blind person allowance and my father’s state pension, it’s €250 a week. The minimum to put them in a nursing home would be €600 a week. I get three 30 minute home help slots a week to help shower my mother. I make sure to have her up and get her breakfast beforehand, because the 30 minutes would be gone doing this otherwise. I should have someone every day. Tomorrow I could get a letter telling me that I’ve lost the three I have. If she falls and breaks her hip, or takes me with her, what happens to them? If something happens to me, what happens to them? The actions of the politicians will have me and my kids and my great great grandkids paying for this. When the TDs take a cut in their wages, all they do is give back a measly sum that they can afford to do without. With this week’s budget, I’m fearful of the same crowd getting a hit – the carers and the home help packages. I’m living in the real world. I don’t know where these politicians are living. To see my mother and father, who worked to put this country on its feet be treated like this is unacceptable. If they leave the carers alone, some other poor unfortunate will pay. The TDs will never pay, it’s always us that pays. That’s the way this country will always be. We always get the slap. Read: Readers’ Panel Part One: What are you expecting from the Budget? Email “Readers' Panel Part Two: What are you expecting from the Budget?”. Feedback on “Readers' Panel Part Two: What are you expecting from the Budget?”.